Sealine will be unveiling, at the Tullett Prebon London Boat Show, an animated walkthrough of their revolutionary new sports cruiser, the SC42, due for launch next summer. 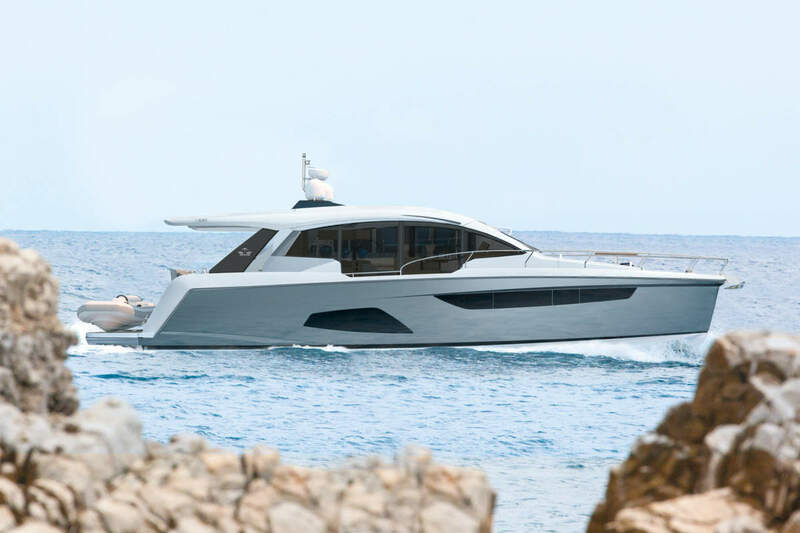 The SC42 is a bold and innovative new design offering more social space than on any other cruiser of this size. Perfect for outdoor living, the SC42 can be transformed from wind in the hair boating to full protection in a matter of seconds. The craft features a unique full length, soft top convertible roof system and large opening side windows which let in the light and the fresh air. One of the most significant design features of the SC42 is the cockpit layout which makes maximum use of the full beam width of the boat for seating and entertaining. There are four wide forward facing seats at the helm, a fully integrated dashboard, plus a wet bar and pop up TV behind the seats. To the rear the flexible seating and dining arrangement offers comfortable dining for 10 either as one large group or on two separate tables. This space can easily be transformed into rear or forward facing sunbathing areas so that those on board can enjoy the sun and sea next to the hi lo private bathing platform, watch films and socialise with others in the cockpit. There is ample storage throughout the boat. Engine options include stern drives with joystick control or full IPS. The luxurious forward master cabin will have separate shower and toilet compartments, whilst the three berth mid cabin offers five different sleeping options plus an ensuite shower area with a bi fold door separating the toilet. The saloon has space for eight to dine in comfort and the galley, with its full height fridge freezer, has over 2.5 metres of worktop and plenty of storage. The Sealine SC42 continues the innovative design thinking that has come from the latest Sealine ranges and its certainly attracting new interest from potential customers and the competition alike.